Nestled in the desirable Chappelle Gardens community, this wonderful home offers access to Chapelles Community Association building and amenities, which means exclusive access to a full-size skating rink, basketball courts, a spray park and plenty more! Plus with a new K-9 school and easy access to retail and restaurants, including a new Superstore, this is the perfect place to call home! Even commuting is quick, with convenient access to Highway 2/Calgary Trail via the new 41st Avenue overpass and the Anthony Henday Ring Road! 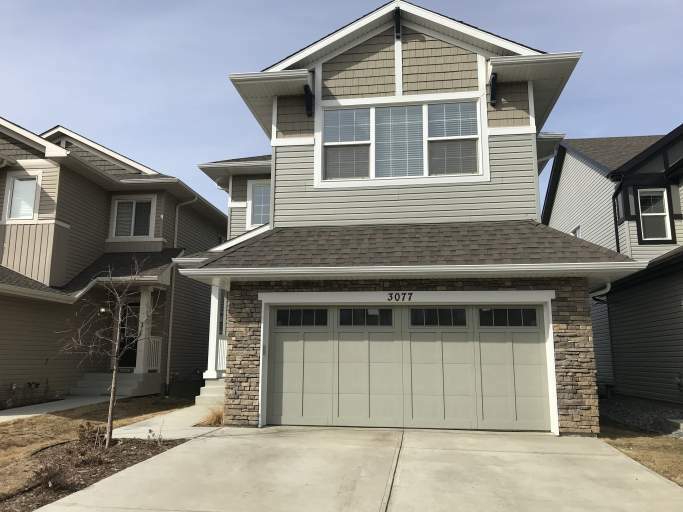 The homes itself is sure to wow with stunning nine foot ceilings, a large double garage, airplay speakers wired throughout, and a walk-out basement! The main floor boasts stunning laminate flooring and an amazing open concept layout which perfectly blends the kitchen, living room and dining room, making a space worthy of entertaining! The kitchen is perfectly designed with plenty of white cabinetry, stylish counter-tops, a small island, beautiful tile accents, plus a large pantry closet. Accented with stainless steel appliances including a fridge, stove, microwave and even a dishwasher, this kitchen is sure to impress! The kitchen opens into a large dining area overlooking the large deck and backyard. The massive living room features a large stone fireplace accent and is filled with tons of natural light through its large windows. The main floor also offers a spacious den, perfect for an office or study space, the laundry room, a half bathroom and a mud room off the garage which offers built in closet and cubby spaces. The upper level is home to a gigantic master bedroom with enough space for any furniture set! Off the master bedroom is a stunning spa-like five-piece bathroom, home to a large soaker tub, his and her sinks, a stand-up shower and a walk-in closet. Two more large bedrooms, another four-piece bathroom and plenty of closet space finish this level. The walk-out basement is unfinished, perfect for storage or a play area. Enjoy the coming summer months in your own backyard! This home features a large deck, perfect for a BBQ and patio set, and a fully landscaped and fenced backyard! Don't miss out on this amazing home! Call today to schedule a viewing!